The County of Merseyside has no streams containing trout. 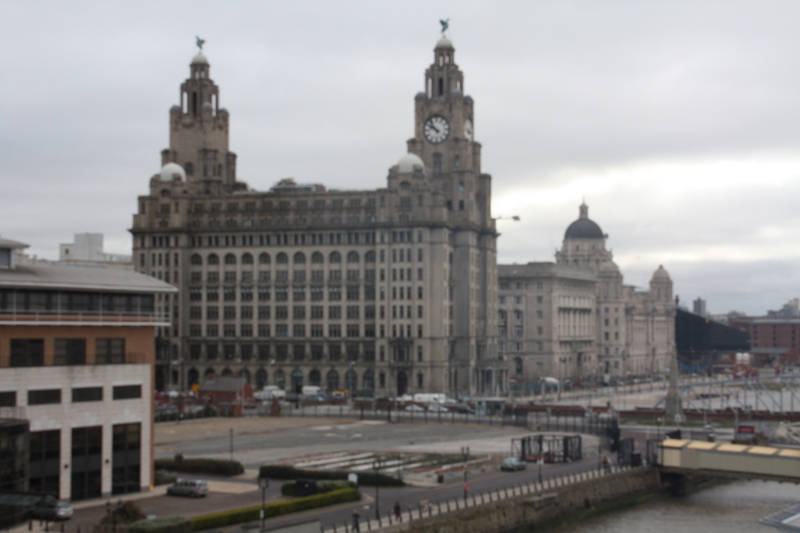 The problem is that that is known as Merseyside is low, with lots of urban connurbation. Rural areas in the northern bit is mostly low lying acid peat farmland (= mossland in S Lancashire) and with very few streams. The largest, the Alt, is clean in places, but not trout water. On Wirral there are even fewer streams, none with trout. Note, however, that sea trout are now running the Mersey, though they are not catchable in the river here or the Ship Canal! Malcolm Greenhalgh is both a naturalist and a fly fisherman. After reading biological sciences and researching estuary ecology for his PhD, he lectured for sixteen years before becoming a freelance writer on his fortieth birthday, and anglers will be aware of his prowess, and expertise from his many interesting and challenging articles in the angling press. His view is supported by Tim Jacklin and Paul Gaskell of the WTT, and by Kevin Nash and Gareth Pedley of the EA…., as well as the officials of the many Angling Clubs in Merseyside with whom I have exchanged correspondence. So…maybe my ‘Mission’ will not succeed, but this sad news is no reason to stop searching. Suffolk, my nemesis, PJ ! And it is all down to John (Anderson), and his enthusiasm for my mission, and his fulfilment of a promise made after a blank in May. That day was an unbelievably hot (as we now know only May was) and bright day, and with weed and reed growth, already massive, we guessed that the trout on the Lark at Icklingham which the cormorants had disregarded, were probably hiding in the stem and root stock well away from my enticing casts. We saw no rise, nor swirl, nor ‘nothing’ that morning to John’s needless embarrassment. But his company through the morning and a delicious lunch at the Red Lion (well worth a visit…several local ales, and great food) and our endless chat, seemed enough to motivate this retired GP and fisher, to guide me again, knowing that trout streams in Suffolk are scarce. After two more ciabbattas, and some cleansing ale, we were back on his stream…”I have a plan”, he revealed. And this time we headed downstream to below the weir, where it is very wade-able. His plan involved the PTN, and my set up included a weighted #20 (from Five Rivers Lodge), tied below a bushy caddis pattern with a pink-ish parachute…OK, a float, if you must…and it did feel as though I was trotting (!). where John had once caught a small pike, one of the few casts which I put below the alder overhanging it, saw the floater dip, and a lift and resistance which became serious, meant I had a ‘fish on’….was it a chub, I worried? It planed (‘kited’ , if you listen to John Wilson) across the weir, pulling very hard and in that erratic style which singles out our preferred species. As it neared, its colours still confused me, but with John leaning to give me his long handled net , I saw SPOTS…and knew! Caution, caution, caution…this is Suffolk’s only trout stream…and when he was netted, I am not sure whether John’s pride in helping, or mine in achieving (is that the right word? ), dominated, but we were both very pleased. 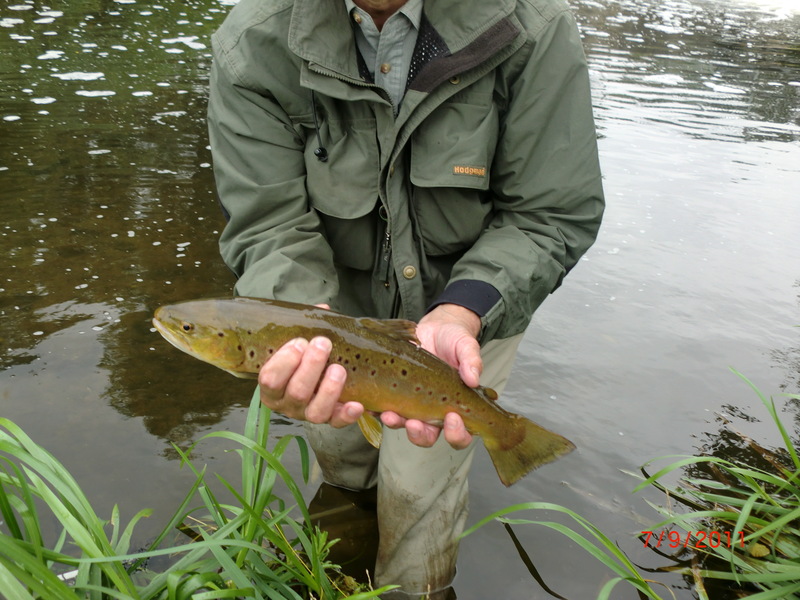 He took the trailing nymph, and the colouration of this fish was unusual…almost orange when he came out of the water. He was a stocked fish weighing in at just over 2lbs, so had probably been in the river three years. It took a while to revive the fellow. He fought hard, as such a fish should. But revived, he returned to his eddied lie. Afterwards we wandered upstream, me casting into the runs, optimistically, where I missed out before, and did again! John’s is a lovely fishery…”but dour”, he acknowledged! But why? The water is clear, flowing quickly through lush streaming weed, in which I am sure nymphal life is prolific, even though on this day we saw little fly life (and not a single rise). There were minnows, galore, but few trout. But we saw several of the species ‘corvus marinus’ and ‘pacifastacus lenusculus’….that’s cormorant, and American signal crayfish, to you and me. Of the latter, I saw dozens, and more than on any other stream I have fished, at the top end of our beat. 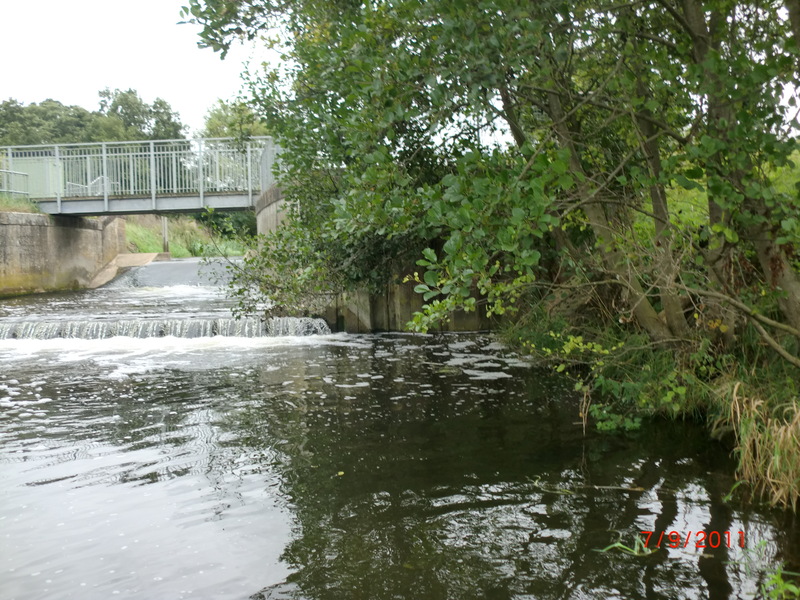 The work of the WTT manages stream and flow…and delivers spawning areas….protection of fish stocks is whose responsibility? The EA? We must all work together for the long term.